The Cathedral of Our Lady of the Angels, designed by renowned architect Jose Rafael Moneo, is the third largest church in the world. Entering from the massive bronze doors designed by sculptor Robert Graham, guests walk the hallways to the main 58,0000 main Nave, which can seat 3000 people. This central part of the church combines polished concrete, cedar wood, limestone, and Spanish alabaster. Open windows along the corridor reveal the cloister garden with limestone walls & walkways, a fountain, and oak and sycamore trees. It is truly a one-of-kind contemporary space for a wedding ceremony. We love this type of grand venue; the dramatic shadows, the shafts of light, and the architectural elements make it such an interesting place for photography. This emotional interaction between the Persian bride and her father actually occurred just before her processional down the aisle to the ceremony at the alter. Private moments like this one are so special to capture as photographers they require anticipating the moment and being prepared at the best angle with the best lens to capture it in a natural and artistic way. 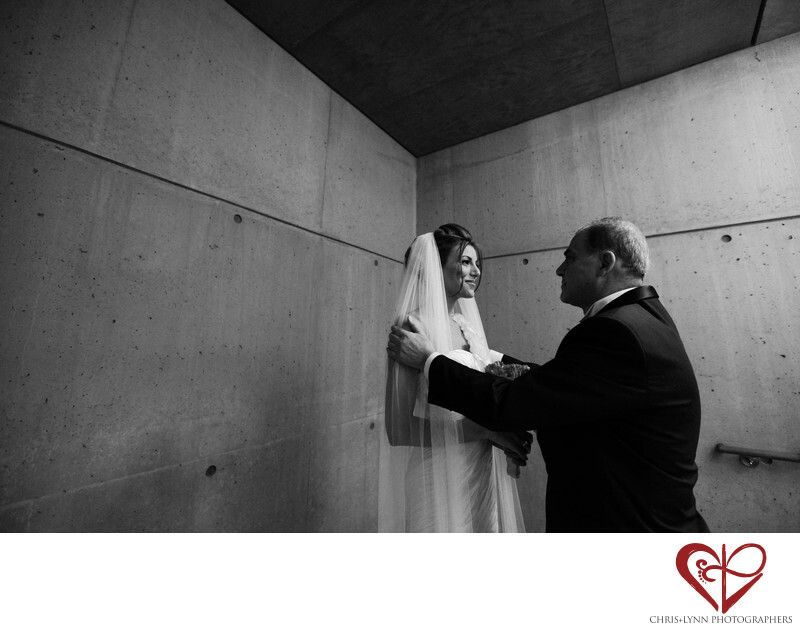 For this image, the composition was intentionally frame to have the lines of the concrete wall converge with the bride to emphasize both the church's architecture and seriousness of the moment. I love the expression on the bride's face as she listens to her father's final words of advice before the ceremony and I love the firmness and seriousness with which he is holding and speaking to her. Location: Cathedral of Our Lady of the Angels, 555 W Temple St, Los Angeles, CA 90012, USA. 1/160; f/2.8; ISO 1600; 16.0 mm.